Sony KDL-32W706B review | What Hi-Fi? One good omen for this telly is that its big brother, the 40in KDL-40W605B, emerged from our testing rooms clutching five stars. Now this 32in looks to follow in its footsteps. 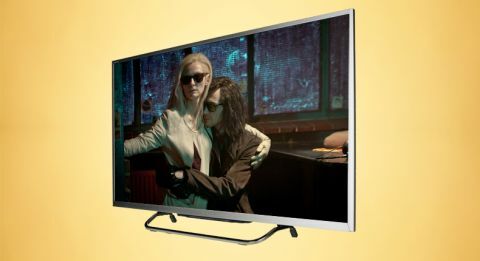 And follow it does… With a good set of smarts, a rich, refined picture and a price within reason, the KDL-32W706B from Sony’s mid-tier W7 Series is another shining small-screen example from the Japanese giant. Unlike some of its lower-res rivals, this baby screen has a Full HD panel (you have to reach its very bottom-ranging R4 Series for an HD Ready one). And every bit of its 1920 x 1080-resolution panel shines. Five minutes into star-studded war film The Monuments Men on Blu-ray, it’s clear that the TV is just as skilled as its bigger, pricier siblings. Sharp, refined edges shrewdly define opening images of opulent paintings and grand government buildings, and a rich, punchy colour palette produces solid reds in Nazi flags as they flap in the wind. Delivering naturalness is the Sony’s real forte. Its even-handed tone accurately conveys the khaki colour of war attire, while skin tones bare realistic warmth. Its stark contrast is worth saluting too: the blackness of army truck tyres is arresting, and the snow-covered woods are Essex-smile white - without glossing over the subtle gradations of mud footprints within them. When it comes to detail, the Sony is right on it. The neat folds in militant uniforms are full of intricate shading, with the specifics on medals apparent too. And low-light conditions bring little deterioration of clarity. As you might expect for £110 more, the Samsung UE32H6400 unveils the finer strokes of Bob Balaban’s moustache a touch better. There’s more insight into crumbly texture of centuries old paintings, and picture frames show more wear and tear. Its improvements in detail and depth are minimal, though, and struggle to fully justify the Samsung's considerably higher price. On its own terms, the Sony certainly delivers. And that’s true of its standard-definition performance too. Whether it’s broadcast channels or a Die Hard 2 DVD, the picture bares impressive definition and neutral balance. Take the latter source and details in Bruce Willis’ bloodied face are plain as day. In this department, the Sony betters the garden-variety of flatscreen quality. In The Monuments Men, as the team reach French shores for their mission, the orchestral track is detailed and the dramatic intent of the score comes through. It doesn’t have the body or dynamic aptitude of the Samsung’s sound, and dialogue isn’t as thick or full, but generally speaking the Sony holds its own pretty well. To get firing cannons really booming, though, a budget soundbar or soundbase such as the LG NB3530A (£190) or Cambridge Audio Minx TV (£200) will do the trick. The Sony’s contemporary design takes our fancy, too. The uber-narrow, tapered bezel wears a sparkly metallic finish and looks superior to the black plastic designs of some rivals. Although we like its silvery coating, it’s available in a black design too, which incidentally replaces the ‘6’ in the model number for a ‘5’. It’s not the slimmest of sets as the chassis’ bottom half - where its connections can be found - stick out quite a way from the thin top. That said, the deepest point is still only 6.3cm deep. Thanks to a compact bar stand - its back feet barely extend beyond the back of the TV – it can be shoved right up against a back wall. Though sturdy, the minimal support behind the unit is noticeable, so be careful not to knock it. Connections are generous for the price. Consistent with models way up Sony’s Full HD line-up, there are four HDMI – one is an ARC channel – and two USB inputs, which share the space on the back panel with scart, component and audio phono inputs as well as an optical and headphone output. There’s no shortage of online services on Sony’s Entertainment Network (SEN). BBC iPlayer, Netflix, Amazon Instant Video, Demand5 and YouTube are the pick of a very broad bunch that should keep you forever fixed for films and TV shows. In case it doesn’t, Sony’s movie-streaming service has a prolific catalogue of rentable titles for £3.50-4.50 a pop, and can be found on one of the home portal pages with its similar music-streaming service. We’re big fans of Sony’s One-Flick Entertainment user interface, which we think betters last year’s XrossMediaBar design. Its multi-page portal is intuitive and easily personalised (your fave apps can be saved to a shortcut panel) and its façade invitingly colourful. With an attentive, punchy picture, decently detailed sound and a smattering of features, the KDL-32W706B is the full works with all the trimmings of a well-designed telly – eye-catching design, seamless interface and bonus accessories. In absolute terms, it may not be the most accomplished picture out there – the aforementioned Samsung sees to that – but a nice price sits it pretty at the top of our wish list.